My home studio at the end of a hollow, where I make handmade paper, is lined with vats of colored paper pulp. My images are abstract and inspired by the natural world around me. I like the sensation of seeing through water or air that I get by adding layers of pulp on my deckle (mesh frame). I mask out the mountain and sun shapes, pull from a vat a layer of pulp for clouds, go in a blue vat and fill sky behind clouds. I remove sun disk for gold and then apply a mountain mask for more layers. Colors change with many translucent layers and water motion. For pulp, I use mostly abaca, which I buy beaten, and color with the same lightfast pigments that are found in artist's paints. Finished pieces range in size from cards to 4 by 8 feet. 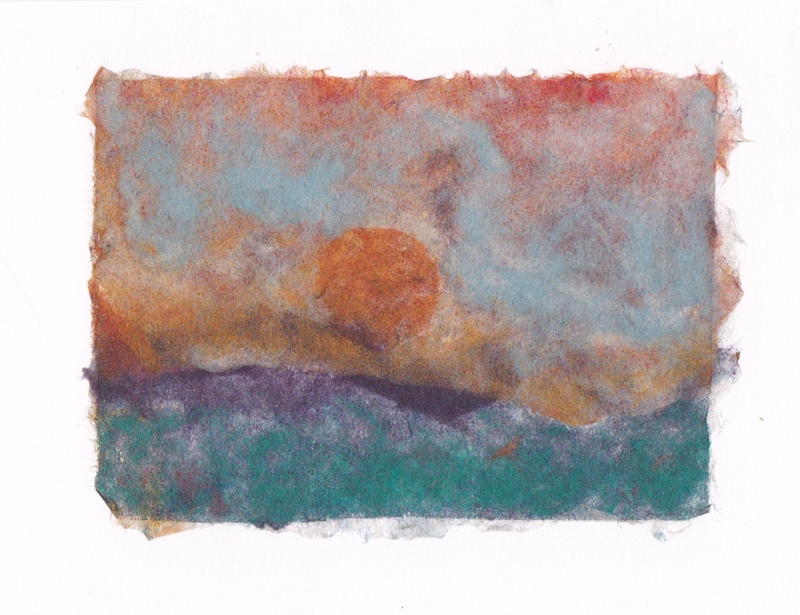 For the past 30 years I have studied papermaking by taking workshops and by experimenting. Workshops include two weeks at Penland, a flax workshop with Helmut Becker, a very large paper class that included kozo preparation, and most recently a class with Amanda Degener at Pyramid Atlantic. This class included two and three dimensional paper using armature, pulp spraying and large format. I admire the work of Karen Stalager and was fortunate to attend a workshop given by her. I have also studied natural materials with Jeanne Drevas and have experimented with flared bark frames. I have recently rejoined Middle Street Gallery and have been a guest artist on all the Rappahannock Studio Tours. I had a studio space at River District Arts in Sperryville and before that showed at R H Ballards.